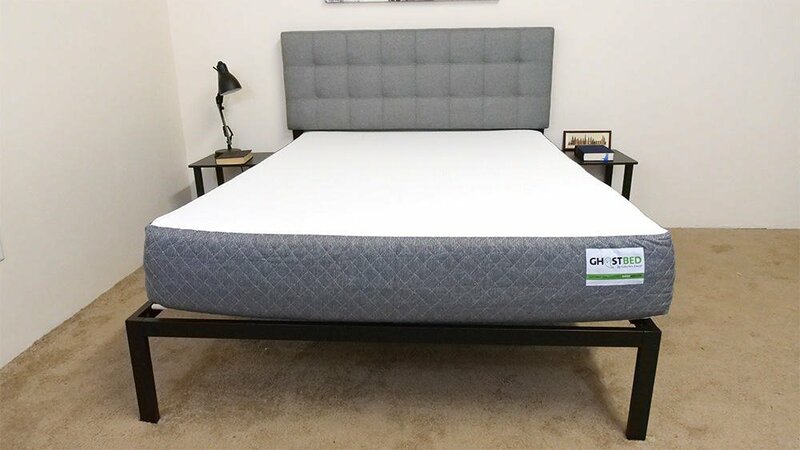 In this review I get to take my first look at GhostBed, one of the biggest online mattress retailers. GhostBed is a bed in a box mattress that isn’t sold in stores, so I was excited to finally get a look at it. Interested in learning more about what the GhostBed as to offer? Read on for my full review! Click here to skip to the summary section if you’re in a hurry. GhostBed was started in 2015 as a division of industry veteran Nature’s Sleep. 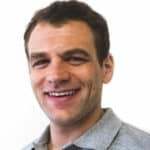 GhostBed CEO Mark Werner’s goal when starting the company was to make the mattress shopping experience better by eliminating the need to deal with salespeople in the showroom. In the beginning, GhostBed offered just one mattress but has since grown to offer a wider range of sleep products such as bases, foundations and pillows. GhostBed has also released a second mattress called the GhostBed Luxe, which has a construction focused on creating a cool sleep environment. As I mentioned before, GhostBed is a bed in a box mattress that needs to decompress before you sleep on it. If you would like to see my experience setting up the GhostBed, you can check out my unboxing post here. When I first take a look at the GhostBed I notice the use of both latex and memory foams in the construction. 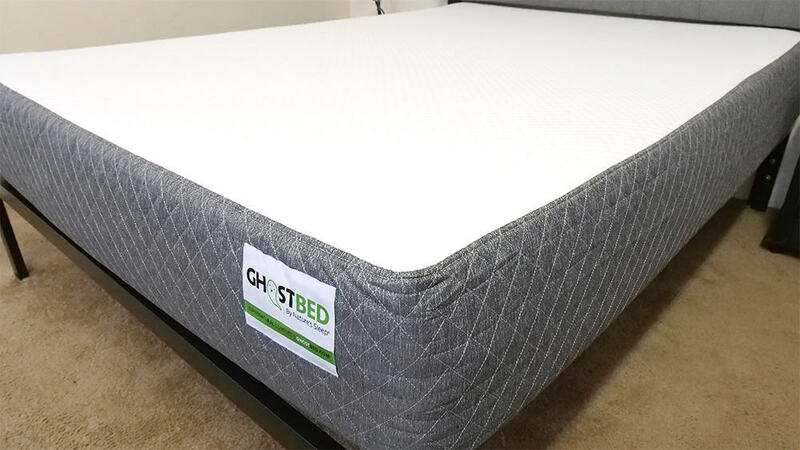 By combining these two materials GhostBed is attempting to provide a good mix of bounce and pressure relief, giving the sleeper the best of both worlds. The GhostBed construction uses dense foams of high quality to help make the mattress more durable. Along with this it also takes advantage of latex’s cooling properties by placing it closest to the sleeper, defending against sleeping too hot. Cover – The cover of the GhostBed is a combination of viscose and polyester and is pretty stretchy, so you won’t have to worry about it bunching up when you adjust position on the mattress. I found it to be pretty thin, so it’s going to allow air to flow through the mattress for temperature regulation and cooling. The thinness of the cover also means it won’t interfere with the feel of the top foam layer of the mattress. Comfort Layer – The comfort layer of the GhostBed is 1.5 inches of latex foam, a material that has a quick response to pressure. This quick response gives the mattress some bounce and keeps the sleeper from feeling stuck in the mattress. Latex also does a good job of dissipating body heat to defend against sleeping too hot. This layer is also aerated to improve breathability and airflow, which should also improve temperature regulation and cooling of the mattress. Compression Layer – Below the comfort layer is 2 inches of gel memory foam. This layer is going to allow the sleeper to sink in and provide some contouring to the body. A deeper memory foam layer like this is a nice feature for side sleepers, as they tend to dig further into a mattress due to higher weight concentration. Memory foam has a reputation for trapping body heat, but the gel infusion should help to draw that away from the sleeper. I would also like to point out that by placing the memory foam beneath the comfort layer, GhostBed is using the latex foam to defend against trapped body heat and feeling stuck in the mattress. Base Layer – The foundation of the mattress consists of 7.5 inches of high density poly foam. This layer provide support to the mattress as well as some durability. The base also gives the GhostBed its shape. 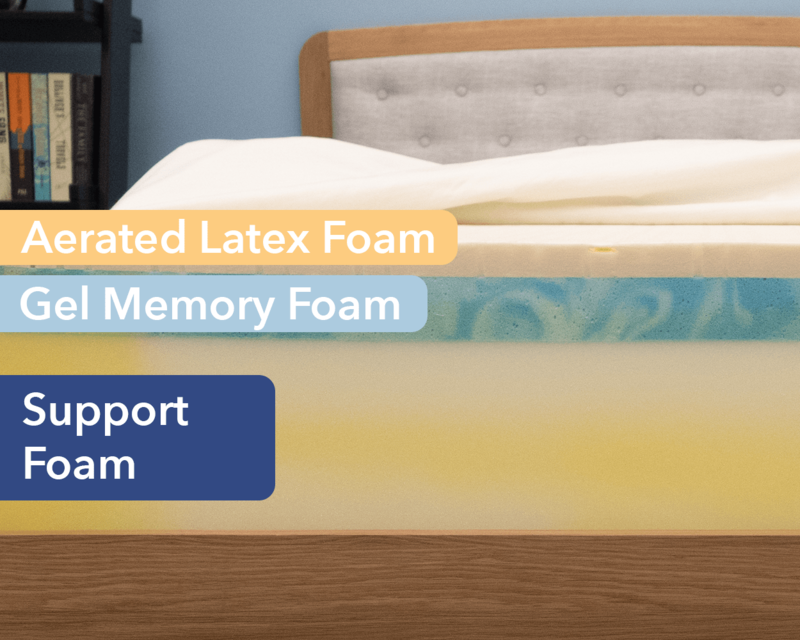 FAQ: What is the difference between latex foam and memory foam? When I first press into the GhostBed, the initial feeling is of the soft latex foam on top. It does allow me push into the mattress a bit, but it has a quick response to pressure. By adding a little more weight I begin to interact with the memory foam layer below that and feel some contouring to my hands. When describing the firmness of a mattress it’s important to note that people of different body types and shapes will feel firmness differently. Rather than giving just my opinion on the overall firmness level of the GhostBed, I brought in three other people to give their opinion as well. This will give you a better sense of the firmness range you can expect from the mattress. As you can see from the chart above, our testers found the GhostBed to be between a 6/10 and 7/10 on the firmness scale. 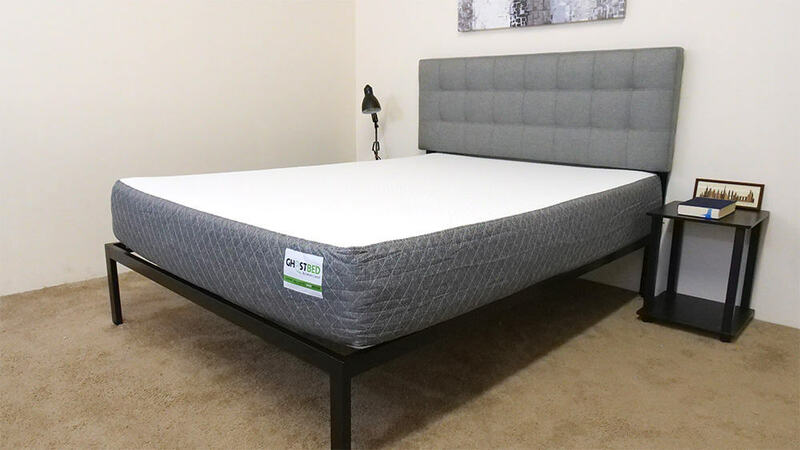 This puts the GhostBed squarely in the medium firmness range, which means it will provide a solid mix of support and pressure relief if you don’t sleep specifically in one position. 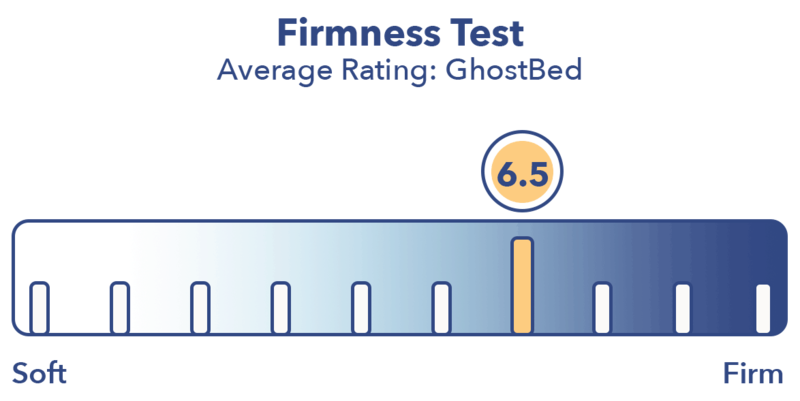 I personally rated the GhostBed as a 6.5/10 firmness, which is generally considered medium firmness. I found the mattress provided a good general feel and allowed me to lie comfortably in multiple positions. I should also note that because of the quality materials used in the construction of the GhostBed I expect it to be a bit more durable than some of its competitors. Imprints can sometimes form on foam mattresses, but the dense foams in the GhostBed should defend against that. This should also help provide support for heavier individuals who at times can have trouble with foam mattresses. Instead of just describing the feel of the GhostBed, I wanted to give a visual representation of where someone may feel pressure points while lying on it. To do this I placed a pressure map on top of the mattress and lied on my back, side, and stomach. On the image below pressure will be represented from blue (low pressure) to red (high pressure). When lying on my back my weight was evenly distributed and results show low pressure across my entire body. The latex comfort layer did a good job of filling in the space beneath my lower back for support, which is good for back sleepers. While I did push into the mattress a little bit, causing me to feel a little contour from the memory foam, I didn’t feel stuck in the mattress and was able to change positions easily. Once I rolled onto my side I had a higher weight concentration over a lower surface area which caused me to dig into the mattress a bit more and interact with the memory foam layer. Memory foam is generally a good material for side sleepers as it allows them to sink further into the mattress for more pressure relief. While side sleepers sometimes have issues with pressure points at the hips and shoulders, I didn’t feel these forming while lying in this position and the results above show that. 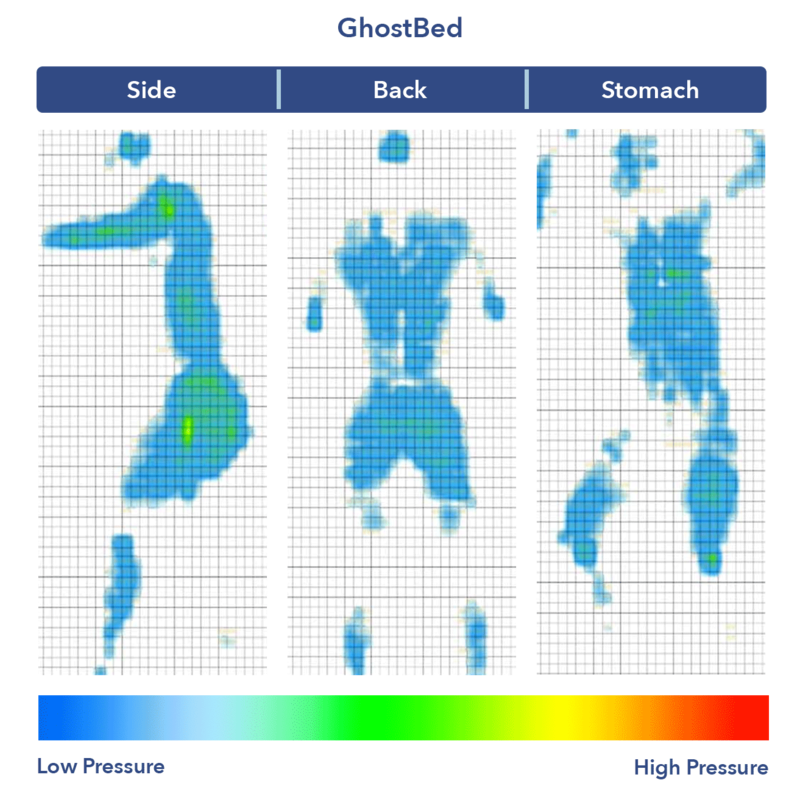 When lying on my stomach, my weight was again evenly distributed and the pressure map shows low pressure across my body. Stomach sleepers want to be aware of possible pressure on the chest as it can make breathing more difficult, but I had no problem breathing on the GhostBed. Stomach sleepers will also want to make sure their hips don’t sink too far into the mattress, which is why they often prefer firmer mattresses. I found that my hips sunk in a little bit, but that is pretty common for me as I have heavier legs. If you are sharing your bed with a partner, you will want to know what it will feel like when the other person gets into and out of bed or tosses and turns during the night. 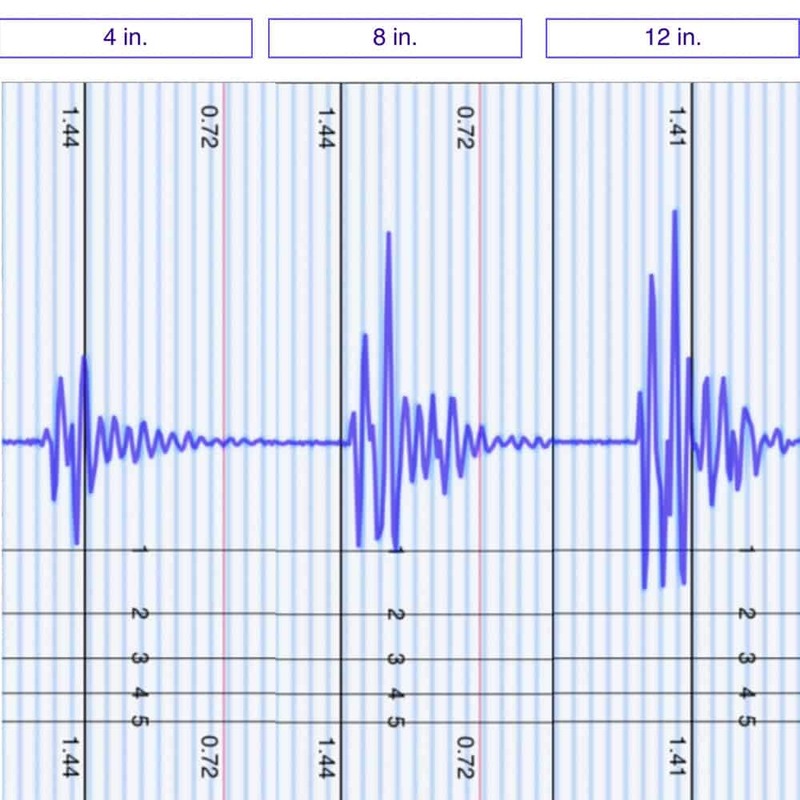 This next test is helpful in showing the intensity of motion that is detectable from one side of the GhostBed to the other. The 4 inch drop simulates someone changing positions on the other side of the bed and the results show a small disturbance. This is a pretty good result for this portion of the test and would mean you wouldn’t feel someone rolling around too much if sharing the bed. The 8 and 12 inch drops simulate someone getting, or jumping, into bed and show higher levels of disturbance. These results are on par with what I have seen from other bed in a box mattresses when performing this test. For many people buying a mattress it will be important to know if they will feel like they’re sitting on top of it or sinking in. 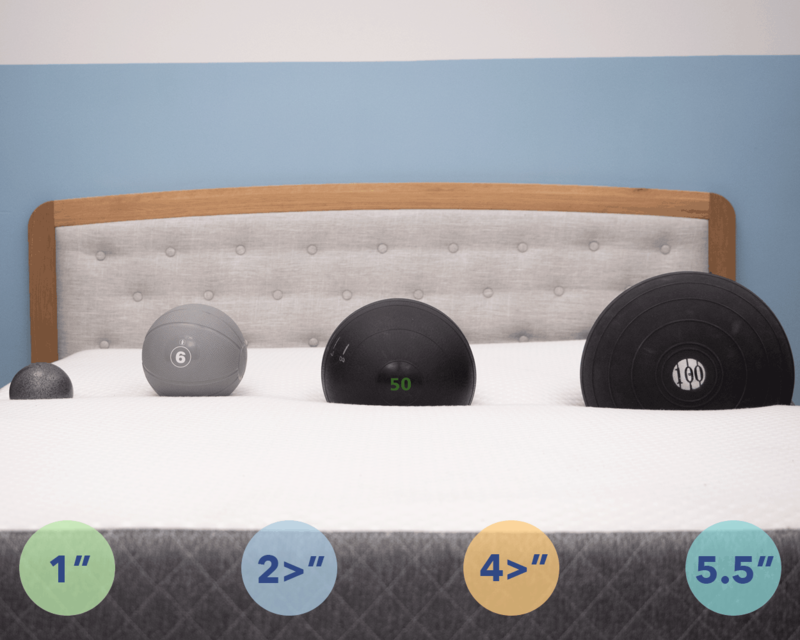 In order to get a good idea of how someone might sink into the GhostBed, I used four balls of varying sizes and densities (a 6 lb medicine ball, a 10 lb steel ball, a 50 lb medicine ball, and a 100 lb medicine ball) and place them on the mattress to measure how much they compress the surface. If you’re going to share your bed with a partner and need to use the entire surface, then edge support is something you are going to want to take a look at. Foam mattresses sometimes struggle to live up to the edge support of traditional innerspring mattresses, so I wanted to have a look at how I would feel near the side of the GhostBed. Lying on my back I felt even support on the side of the mattress when compared to the center. When I got really close to the side, like in the image above, there was a pretty good amount of compression through the latex and memory foam layers. That is to be expected out of softer foam layers such as these. The latex comfort layer allowed me to adjust and change positions easily near the side of the GhostBed. When hanging off the side of the mattress a bit I again see some compression through the soft layers of foam, but nothing unexpected from a foam mattress. Once I sit up on the side of the mattress, think putting your shoes on in the morning or getting into bed at night, my weight is concentrated over a smaller surface area. This position does a good job of showing what increased pressure will do to the edge of the GhostBed and while I did see a good amount of compression, it was nothing out of the ordinary for a foam mattress such as this. Sleep Trial: GhostBed offers a 101 night trial period. Warranty: There is a 20 year warranty on this mattress. Shipping: The GhostBed ships free to the continental United States and it will arrive compressed in a box. Weight 250lbs or more? Check out my best mattress picks for heavy sleepers. 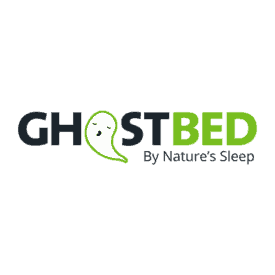 The GhostBed is a value, coming in at a lower price than many of its competitors. Is the GhostBed right for you? Now that we’ve taken a deep dive into the GhostBed, it’s time to talk about who I think it would be a good fit for. Sleeps Cool: The construction of the mattress uses gel infused memory foam and places beneath a layer of aerated latex foam to defend against sleeping too hot. Both the design of the GhostBed and the materials used will help with temperature regulation and cooling. Sleep in Multiple Positions: The GhostBed has a medium firmness to it which should appeal to a wide array of sleeping preferences. By not leaning too far to the plush or firm sides of the spectrum, the GhostBed provides a good environment for multiple positions. Pressure Relief with Bounce: The combination of the soft latex comfort layer with the memory foam beneath it allowed me to sink into the mattress for pressure relief. By placing the responsive latex over the memory foam, the GhostBed allow me to adjust positions without feeling stuck. Value: The GhostBed uses quality materials to create a solid mix of pressure relief and support in a durable mattress. Given the quality of construction in the mattress it is set at a surprisingly low price when compared to similar products in the market. Support and Durability: The denser foams used in the construction of the GhostBed should help the mattress defend against the formation of imprints. Along with this, these foams will provide better support to heavier individuals than lower density alternatives.